Often a story begins with looking back-back to the good old days. Have you recently heard a dairy cattle breeder speak or write about how cows used to last until they were ten years old and that today cows are one lactation wonders? 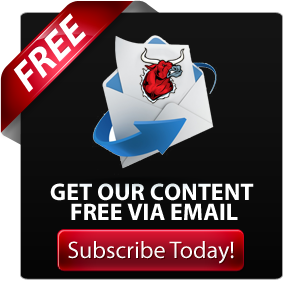 Should Bullvine readers accept this perception as fact? 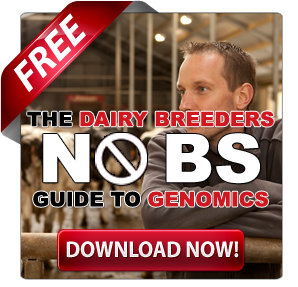 Especially knowing that breeding dairy cattle is about creating a superior cow for the future? Let’s think this one through. Holsteins with the genetic merit of the 1960s have been maintained for study and comparison purposes at a University of Minnesota research station. The photo below shows the physical appearance of cows from back then. 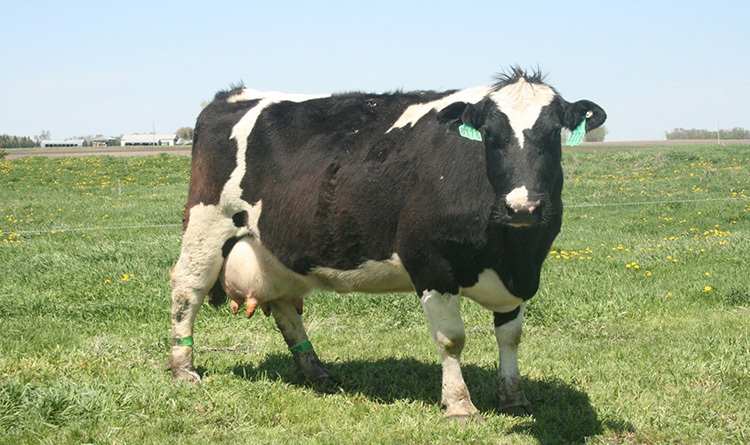 This cow from the U of M Morris Research Dairy is a living representation of genetics from the 1960s. 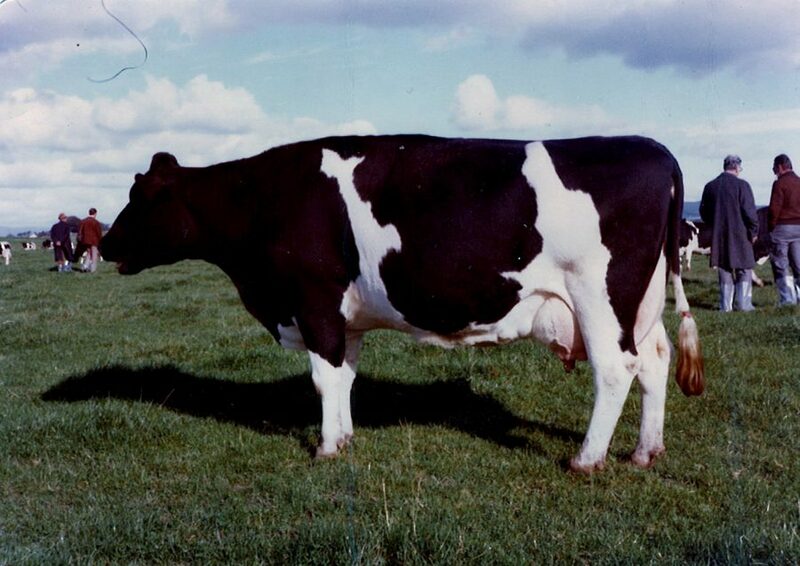 Compared to present day US Holsteins the cows from the 1960s were shorter, beefier, had udders that deepened quickly with age and they produced half as much milk (35 pounds per day from first calving to herd removal). Heifers calved for the first time at 27-28 months of age and a significant percentage of first calvers were culled after difficult calving or for low production or physical problems including undesirable udders. Also, twice as many calves died before weaning as happens today. 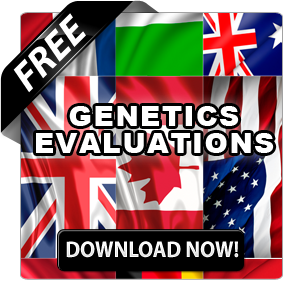 By comparison to today, there were fewer genetic indexes and they were less accurate. The theory of comparisons that utilized BLUP had yet to be developed by Dr Charlie Henderson at Cornell. The fact is those good old days of the 1960s were not actually that great. Breeders lamenting for those years are selectively remembering that only the top 10-20% of first lactation Holsteins excelled and those breeders are not remembering that 20-30% of cows one month into their first lactation had health issues, low milk, low-fat test, deep udders or weak median suspensory ligaments. Over half the first lactation cows classified Good or lower in Canada in 1965. Breeders thought in terms of their best animals and not what their herd average was. It is not just in North America where the dairy cow has changed. Dual purpose cows have gone by the way and single purpose dairy cows have become the desired milk cows in “dairy” countries. 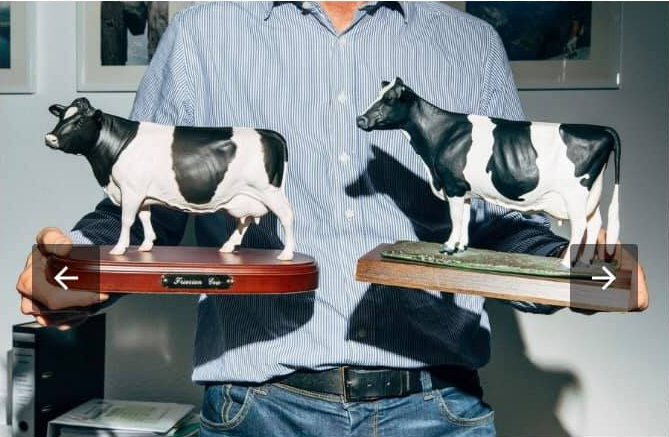 The picture below of the President of the German Holstein Association holding two cow models shows how fifty years of selective breeding has changed German Holsteins. 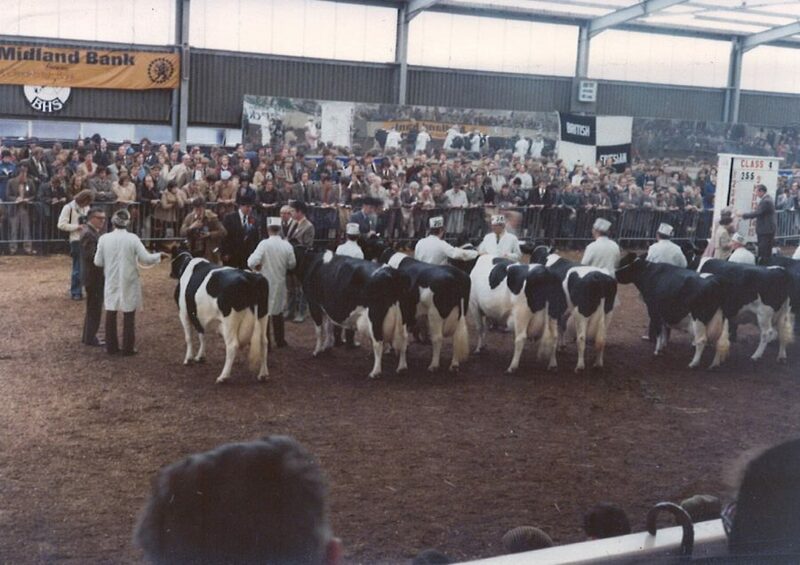 The next two pictures are pictures I took of a prize winner and a class line-up at the 1976 World Holstein-Friesian Conference Show held at Stoneleigh England. ‘Holsteinization’ of the Black and Whites were just underway in 1976 in the UK and the judge at that show was still looking for the dual-purpose cow. Other breeds have also experienced significant changes in the ideal conformation of their cows. Below is a barn shot of a ten-year-old Holstein cow that checks many boxes for today’s dairy cattle breeders. Marina first calved at 2-02 and in the next eight and a half years (3060 days) of her life, she averaged 70 lbs. of milk per day. That’s 70 lbs. for every day – milking days plus dry days. It is interesting to note that Marina was just slightly above the average milk yield to her herdmates throughout her productive life while excelling in fat % and protein %. 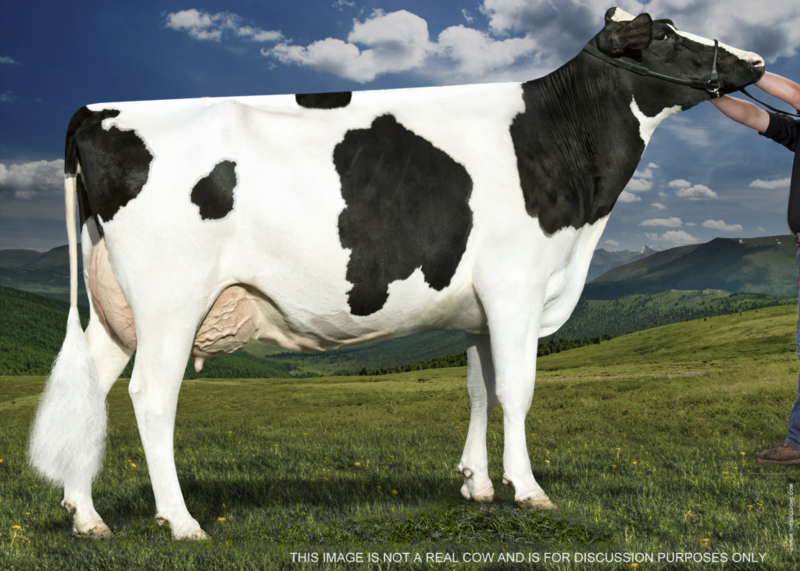 As a young cow Marina ranked top 10% for her genetic indexes, however, today she falls to the top 50% level, due mainly to the very rapid genetic improvement that the Holstein breed has made in the past decade. As ever, time marches on. 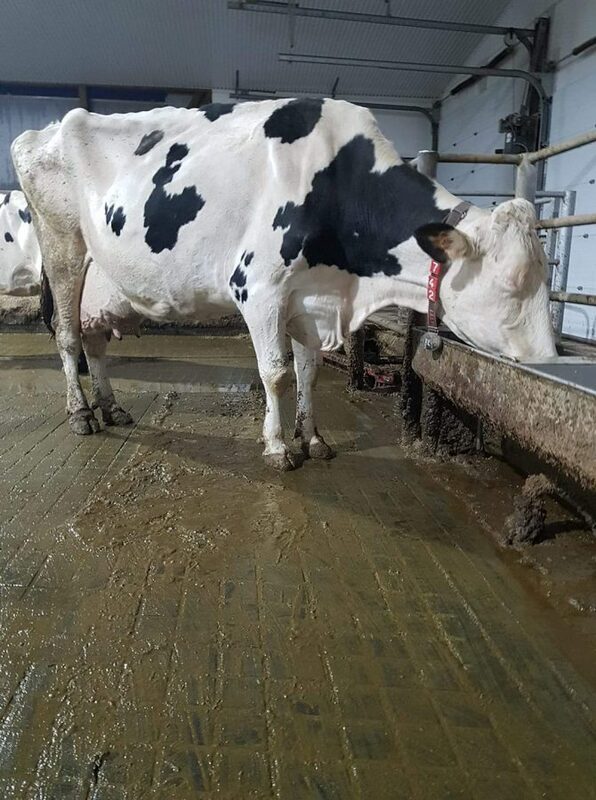 In today’s purebred dairy breeder circles, much discussion can be heard on whether the ideal cow is the great old cow, like Marina, or the productive, low maintenance first to third lactation cow. However, it is A.I. studs and their commercial dairy breeder customers that are now driving the overall genetic progress and for which traits. But that is in 2019 terms. What about the ideal dairy cow for the future? 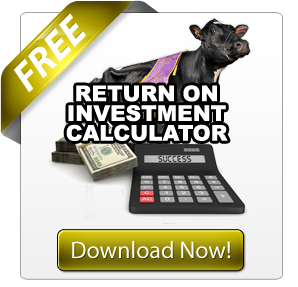 In a recent Milk House post about the cow of the future, which was commented on by almost sixty group members, there was equal support for wanting cows to remain much as they currently are and for wanting cows to be more – more functional, fertile, healthy, efficient converters and to be evaluated on a daily net profit basis. So, that would appear to say in breeders’ mind that the jury is still out on future selection criteria for both sires and cows. 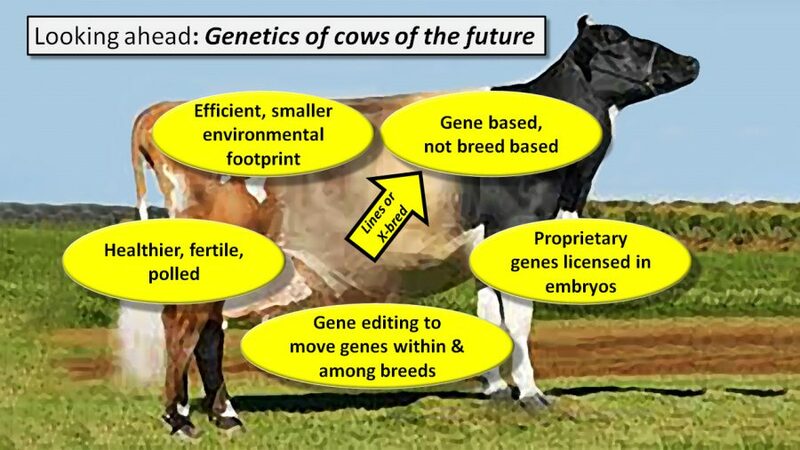 However, as dairy farming continues to evolve into a finer and finer tuned business with average herds size, in the US, moving towards 500 milking cows we can expect significant changes in the traits breeders include in their animal selection programs. Dr Jack Britt, Professor Emeritus, North Carolina State University along with a group of associate researchers and ag extension specialists have done extensive work on predicting what the dairy industry, globally but primarily in the US, will be like 50 years from now. 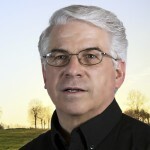 Dr Britt has presented the group’s predictions many times over the past two years, including at the 2018 World Dairy Expo in Madison Wisconsin. They are predicting that in twenty years US cows will average over 40,000 lbs. milk per year and in fifty years over 55,000 lbs. One slide from his presentation is shown below for traits and processes that will be commonplace. Dr Britt has other slides that show: 1) that seven countries (US, India, China, Brazil, Germany, Russia and France) produce 50% of the global milk and twenty countries produce 75%; 2) that with global warming dairy cows will change from an animal that functions best in temperate climates to be heat tolerant; 3) that increased technology and epigenetics will be commonplace; and 4) that there will be enhanced ways of feeding the rumen microbes. 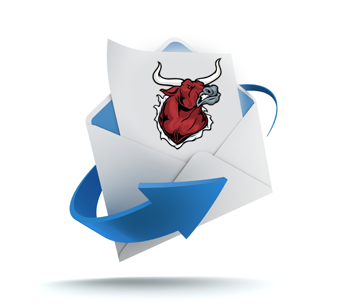 For sure yesterday’s cows got us here… Definitely, tomorrow’s cows will be different. In the future cows will function trouble free for many years in large groups on automated farms. They will live in a multitude of environments and will need to be able to produce a high volume of milk solids. They will efficiently covert non-human food to milk. And genetic selection will turn on net returns over a lifetime and how body parts function most effectively.